It will cost between $75 and $1200 to trim a palm tree. The average cost of palm tree trimming (single palm) is $120. 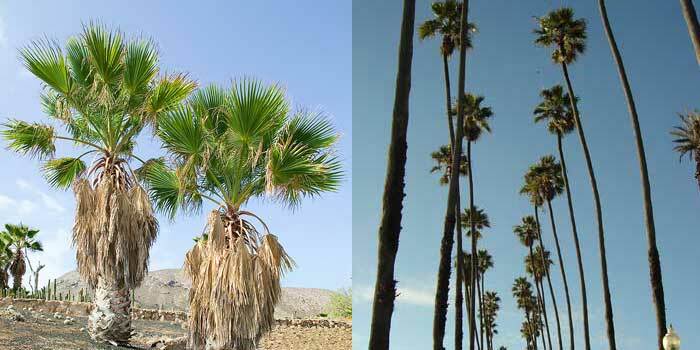 As there are many types of palm trees and greatly varying sizes of the price of palm trimming also varies greatly. Below we have outlined the cost of palm trimming in relation to the trees height, tree trimming price per hour, and we also have included a handy palm tree trimming cost calculator. How often do you need to trim a palm tree? Can palm trees be topped? Will palm trimming services damage the tree? 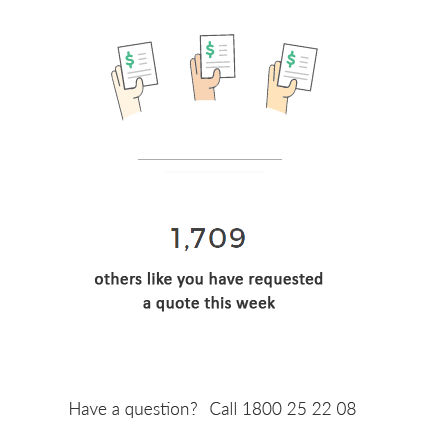 Expect to pay $60 – $75 for a single palm tree trim on average. If you had more than one palm tree that needed trimming, it will cost less per palm. You might pay somewhere in the range of $230 to prune five (5) palm trees. This would be an ‘average tree’ when it comes to height. You can expect to pay $100 for a single tree and $400 for up to five trees. The cost to trim a 30 foot palm tree would be about $200. There will be a discount for multiple trees but the size of tree is a lot more work for pruning. These are some really big palm trees that will most likely need an elevated work platform to carry out the pruning. 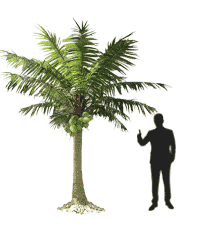 A single regular palm tree this size will usually cost anywhere from $300-$600 for a single tree pruned. This is a fairly wide price range, because the location and accessibility can vary, which will greatly affect the overall cost. Trimming should be carried out on a regular basis to maintain the aesthetic appeal of the tree as well its health. Every year a palm tree should be pruned. This is due to the rate at which they grow new fronds and old fronds die. The way in which you have your palm tree trimmed will determine the time needed between trimmings. The more fronds you take off in one go, the less often they will need trimming. Most people will lean towards taking off a lot of fronds, so the palm tree does not need pruning as often, but it is worth noting that in some states such as Florida this is illegal. They only allow removing palm fronds up to the horizon line. This means only down hanging and lateral fronds may be pruned and no fronds above the horizon line may be touched. The short answer to this is no. If you were to “top” a palm tree completely which means to not only take off all the palm fronds, but cutting it down to the trunk line, it will not regenerate. You will be left with a dead palm tree. You can however, cut off all the palms fronds and new ones will sprout back just as long as you don’t take it down too far. Go tree quote is a FREE service that helps you find the best priced palm tree trimming service near you based on previous uses votes. When a customer request a quote from us, we send them the closest 3 tree services to quote their palm pruning job. After they have received their quotes we ask them who was cheapest and who they went with and why. Based on those votes we can determine who the best priced local palm tree trimming services are and we can get them to quote your trimming job also. 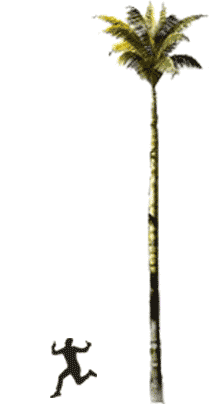 The typical way to scale a palm tree for trimming is to use spikes or “gaffs”. These are a climbing assistant that are strapped to the legs of the arborist to assist in climbing. This will damage the trunk of the tree. It is preferable for the health of your palm the tree service use climbing techniques that will not damage the trunk. Normally this will take place when you have the dead or dying palm fronds trimmed. Palm trees flower annually and grow large seed pods that can be quite messy. It is advisable to get your palm tree trimming service to price for the removal of dead frons as well as seed or flower pods. 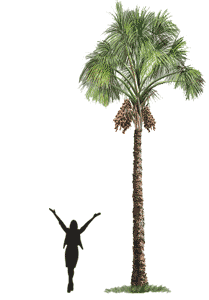 The price range to remove the fruit on a 15 – 20 foot tall palm tree, will be $50 – $70. 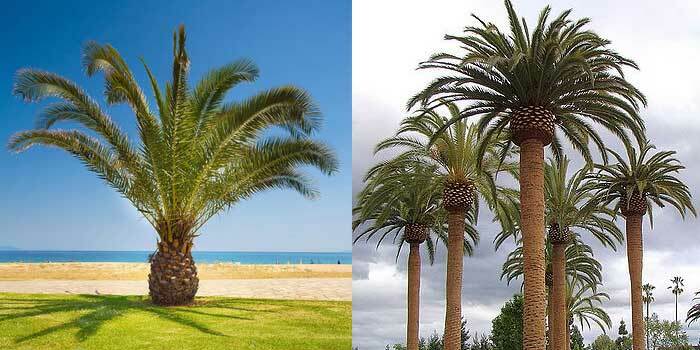 Larger palm trees that are 30 – 40 feet high will usually cost $100 per tree. IMPORTANT: It is going to cost you the same price to remove dead fronds and seed pods as it will to just remove dead fronds. If you get these done at different times of year you will pay double. Palm tree services generally do not charge by the hour. They charge by the job. The reason being each business has a different set up and number of workers. If you were to have 10 palm trees pruned by a company with 2 workers as opposed to a company with 6 workers, the time taken to complete the job would differ greatly. The price would probably end up being similar though, it’s just the tree trimming company with 5 workers will do it a lot faster. This is why they charge by the job. The average price for palm trimming is $120 per palm. (National average from 2018 taken from all palm tree trimming jobs). 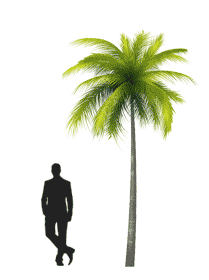 It is hard to go off an average because every palm tree is different and every local economy is different. What palm tree trimming services charge in San Francisco will different greatly to a smaller city. My best advice is to get at least 3 estimates before going ahead with any one of them. These palms are as big as they get. Not only do they grow tall, but they are a very large girth. With their sheer size comes a lot of fronds. You can expect to pay anywhere from $100 for the smaller example on the left, to $700 for one of the larger ones on the right. The overall cost will depend on the number of trees and their height. These palms are also a bit of a pain to trim. The reason being they have razor sharp spikes on the fronds that resemble sharks teeth. There is no trimming these palms without getting spiked many times over, so most palm tree trimming services will charge a premium for these trees. For the smaller example of the left, you would only pay about $90, but for the larger example on the right it could cost you as much as $300 – $400 for a single tree. It will depend on the number of fronds that need removal.